Hollywood movie star John Travolta flew a plane-load of aid to Haiti along with a group of "ministers" from the Church of Scientology who performed Tuesday healing rituals on quake survivors. Travolta, along with Tom Cruise, is one of the leading proponents of Scientology, which some countries treat as a controversial faith but others say is a cult that tricks vulnerable members out of large sums of money. The "Pulp Fiction" star, joined on the trip by his wife Kelly Preston, flew back to the United States after the drop-off from Miami to Port-au-Prince late Monday. The plane, which Travolta flew himself, resupplied the Church of Scientology effort in Haiti with some four tons of food aid and medical supplies and brought along over 50 more of the faith's young, enthusiastic followers. The Scientologists handed out water and medical equipment at the capital's main hospital and trained young Haitians to perform their "Touch Assist" technique that they claim can reconnect damaged nervous systems. 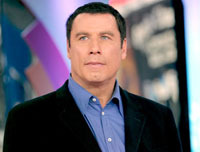 Travolta did a similar aid run in 2005 after Hurricane Katrina slammed the US Gulf Coast, destroying tens of thousands of homes and killing nearly 1,500 people. Founded in 1954 by US science-fiction writer L. Ron Hubbard, the Church of Scientology is recognized as a religion in the United States and claims a worldwide membership of 12 million. Its teachings involve alien interventions in world history, among many other tales, reportedly including the galactic ruler "Xenu" who brought first humans to Earth 75 million years ago. The faith is banned in France for defrauding members, while officials in Germany, Greece, Russia and elsewhere accuse it of tricking members out of large amounts of money.